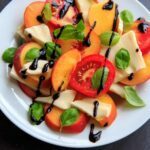 Peach Caprese Salad is a wonderful summer side dish, appetizer or even a meal! Mozzarella cheese, tomatoes, peaches and basil makes a fresh and satisfying dish. Fresh tomatoes with sea salt is one of my favorite things. I’ve been known to go to the farmer’s market and ONLY buy tomatoes. So it’s no wonder that even though I intended to replace the tomatoes with peaches for this recipe, I ended up adding them in anyway without really thinking. Speaking of caprese salad: Caprese is one of those words I used to not know how to pronounce. Is it two syllables? Three? Accents? I had no idea. Except adding “peach” in front of it makes me want to say it with two syllables, because it kind of rhymes (peach ca-prees?). But don’t do that. It’s three syllables. You’re welcome. Another fact about me: I have a hard time keeping plants alive. Any kind of plant, really. Even plants that are supposed to be hard to kill. Like basil. Apparently basil is easy to grow, but any time I buy a plant it ceases to produce any more leaves. So the basil leaves I could pick off my current plant are fairly small for this salad. If you grow big basil leaves, more power to you. But when I say 15 basil leaves, remember mine are TINY. 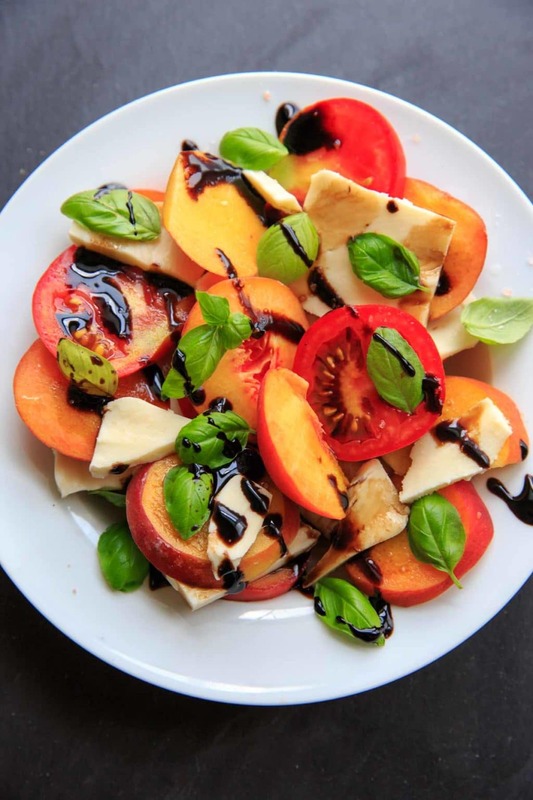 Finally: there is big debate on whether to put balsamic vinegar on a caprese salad. 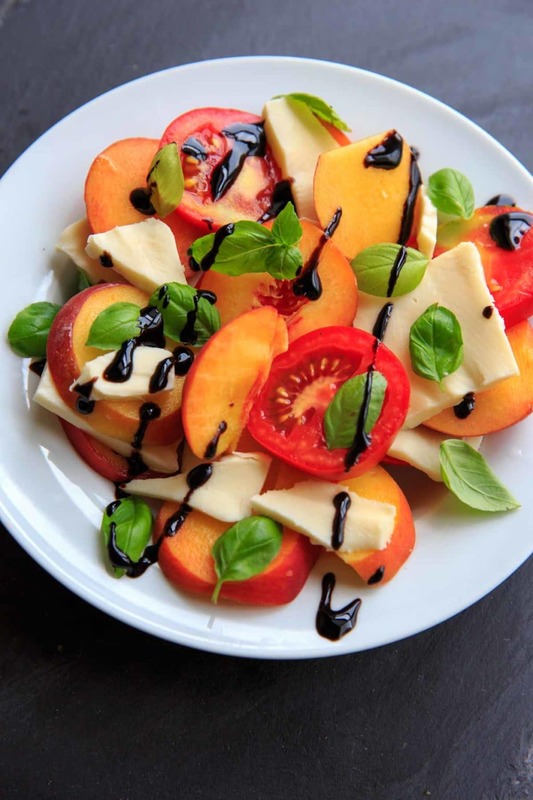 Definitely don’t go overboard (see: chopped caprese salad for example), and leave it off if you’re offended, but – so pretty! 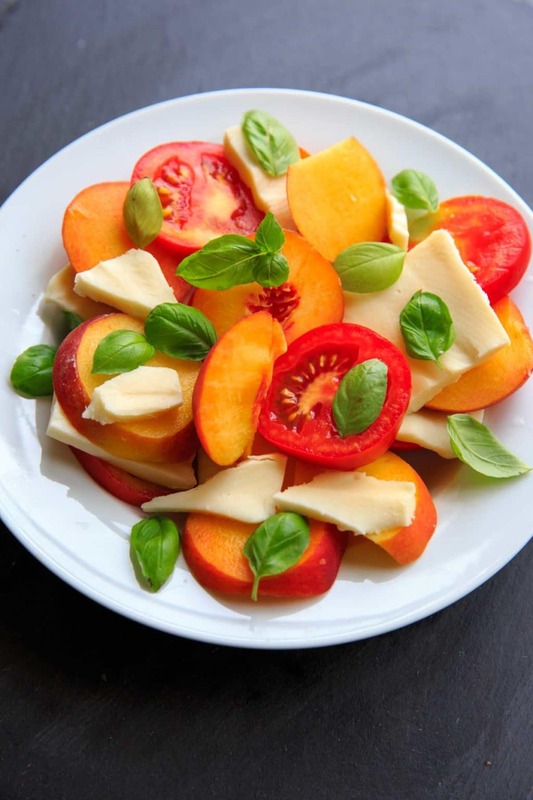 On a large plate, arrange peaches, tomatoes and mozzarella cheese. (Can make them into "sandwiches" or just throw them together). Top with fresh basil leaves. Drizzle with olive oil and balsamic vinegar or glaze. Sprinkle with salt and pepper, and eat! *I could (and did) eat this entire batch for a meal. But will serve up to 4 as an appetizer or side. Nice! So fresh and colorful! Oh, yum! I love it! 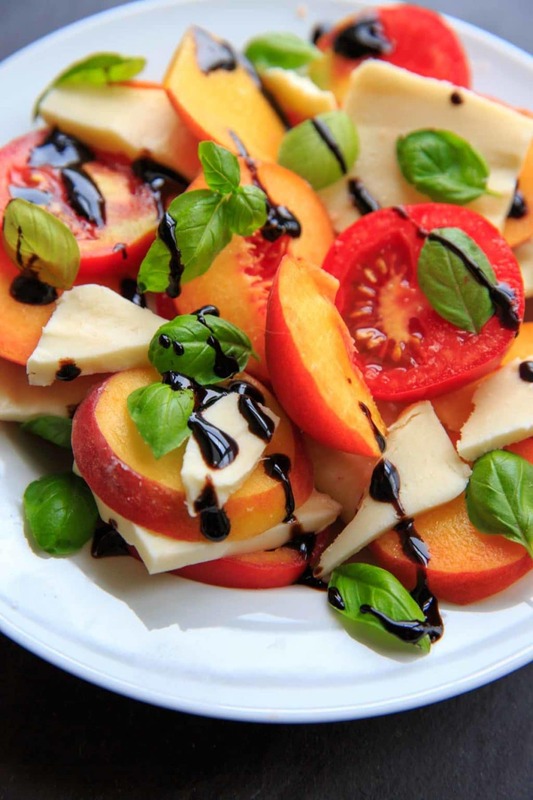 That is genius adding peaches to a ordinary caprese salad!